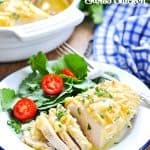 These moist oven baked chicken breasts come together in about 5 minutes with just 5 ingredients! 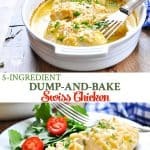 You'll love the creamy white wine sauce and the crunchy toasted almonds on this easy Dump-and-Bake Swiss Chicken dinner! 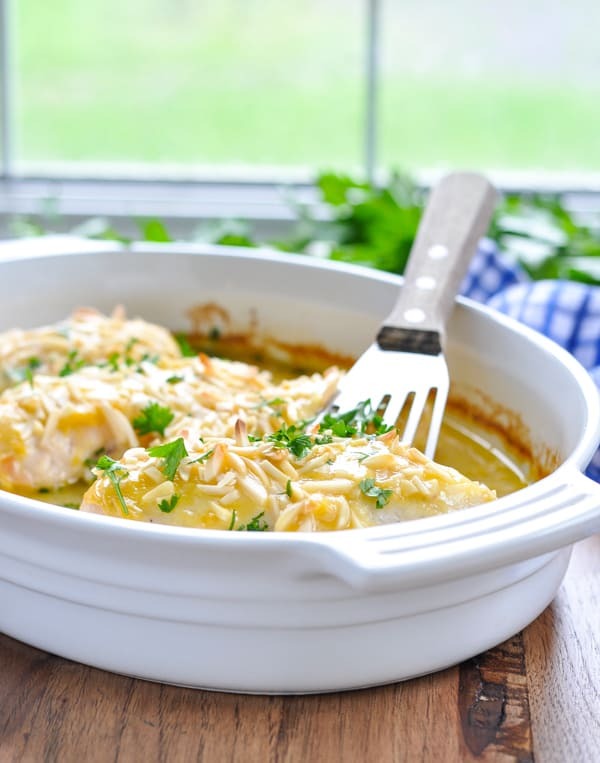 These moist oven baked chicken breasts come together in about 5 minutes with just 5 ingredients! 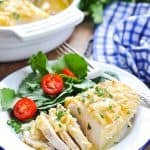 You’ll love the creamy white wine sauce and the crunchy toasted almonds on this easy Dump-and-Bake Swiss Chicken dinner! Busy home cooks can never have enough oven baked chicken breast recipes for dinner, right?! 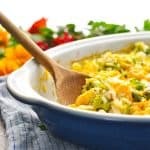 It’s that one ingredient that we always have in the freezer and that I know my boys will always eat (without crinkling up their noses and complaining)! Better yet? When the easy chicken breast recipes call for only a few simple ingredients — just like today’s 5-ingredient Swiss Chicken! While this meal is quick enough to pull together on a busy weeknight, it’s equally appropriate when entertaining guests. Nobody will ever guess how EASY is truly is! First, begin by seasoning your boneless skinless chicken breasts liberally with salt and pepper on both sides. 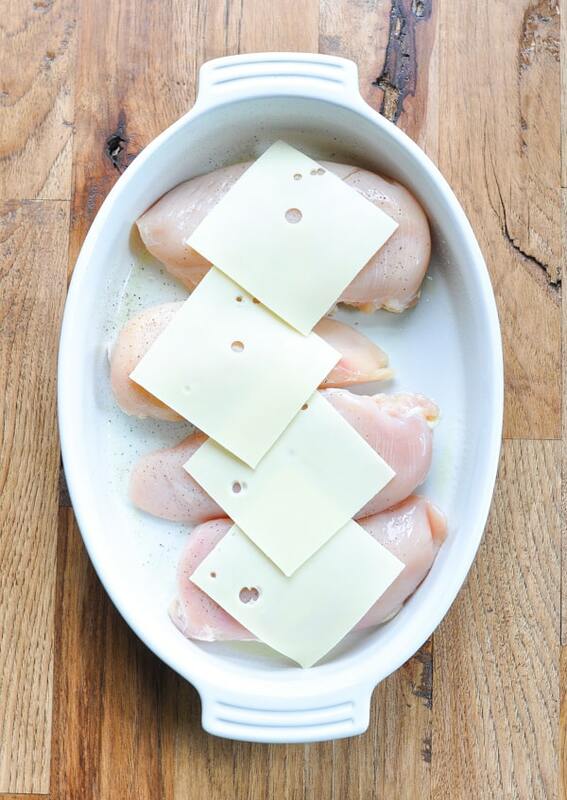 Place them in a large baking dish, and top each piece of chicken with a slice of Swiss cheese. Next, it’s time for the 2-ingredient sauce! 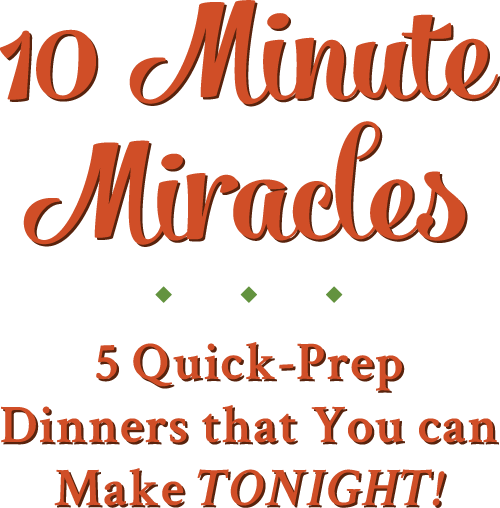 You’ll need a can of condensed Cream of Chicken soup, as well as some white wine. 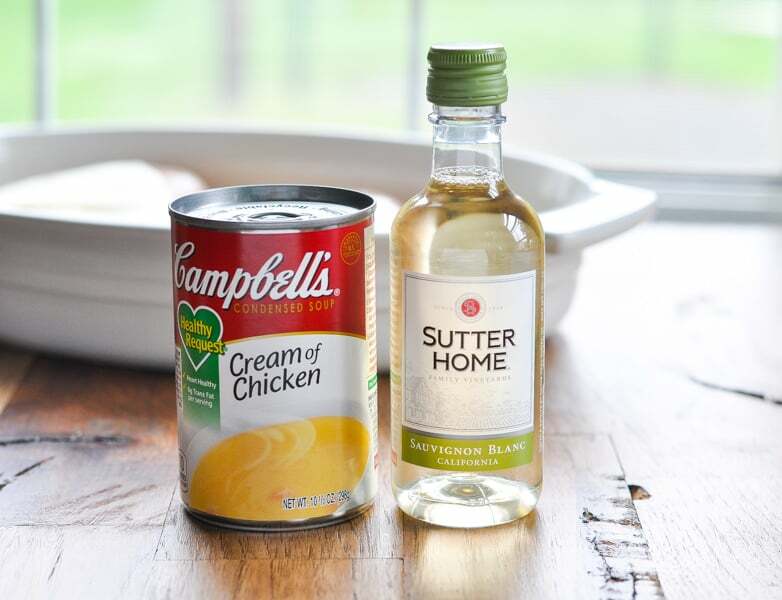 If you don’t want to use wine, you can substitute with chicken broth. Whisk together the condensed soup and the wine (or broth). Pour the sauce over the chicken, and you’re DONE! See what I mean? Five minutes of prep! 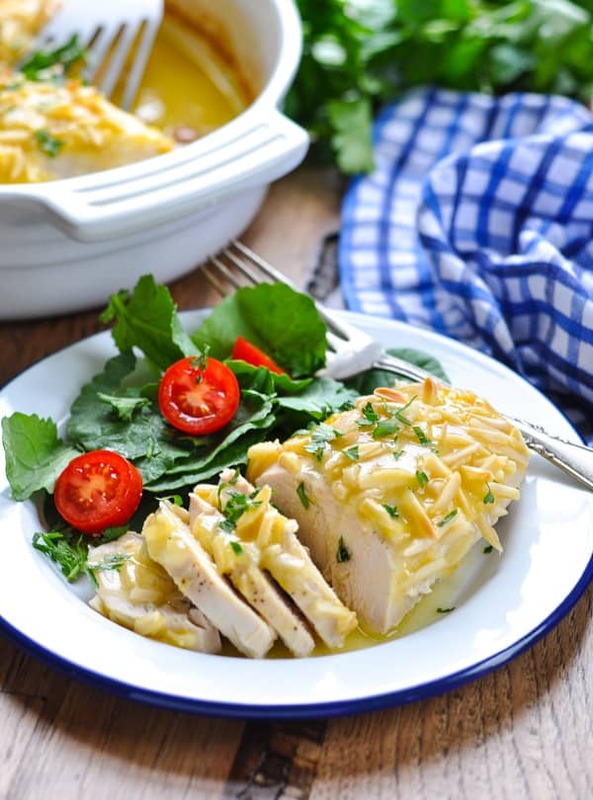 How long do you cook boneless skinless chicken breast in the oven? Most of the chicken breasts that I can find in the grocery stores these days are very large. Here, I’ve used four giant chicken breasts that total about 3 lbs. in weight. The large chicken breasts will need anywhere from about 45 minutes to 60 minutes to roast in a 350-degree F oven. If you’re using smaller chicken breasts, the meat will be cooked through in as little as 30 minutes. That’s why I highly recommend using a meat thermometer to know when your dish is ready to come out of the oven. 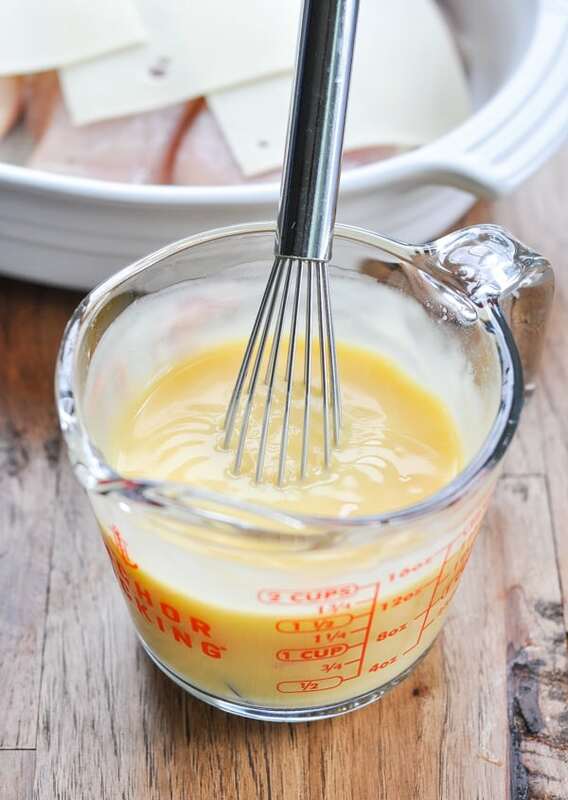 Boneless skinless chicken breasts should reach an internal temperature of 165 degrees F. That’s when they’re done! You can also tell that the chicken is cooked through when it is no longer pink inside and the juices run clear. During the final 15 minutes of baking, you will add the slivered almonds to the top of your chicken. This gives the almonds just enough time to toast and turn golden brown without burning! 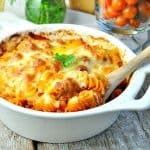 They add the perfect crunch to this delicious, creamy dinner. Substitute chicken broth for the wine in your sauce. Instead of almonds, try topping your baked chicken breasts with pecans, walnuts or chopped hazelnuts. Use Cream of Mushroom soup (or your other favorite flavor) instead of the Cream of Chicken soup. 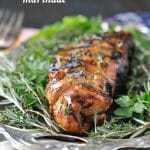 For a quick-cooking dish, slice large chicken breasts in half or purchase smaller 4-ounce chicken breasts. They will cook in about half of the time! Preheat oven to 350 degrees F. Spray a large baking dish with cooking spray. Season chicken on both sides with salt and pepper, to taste. 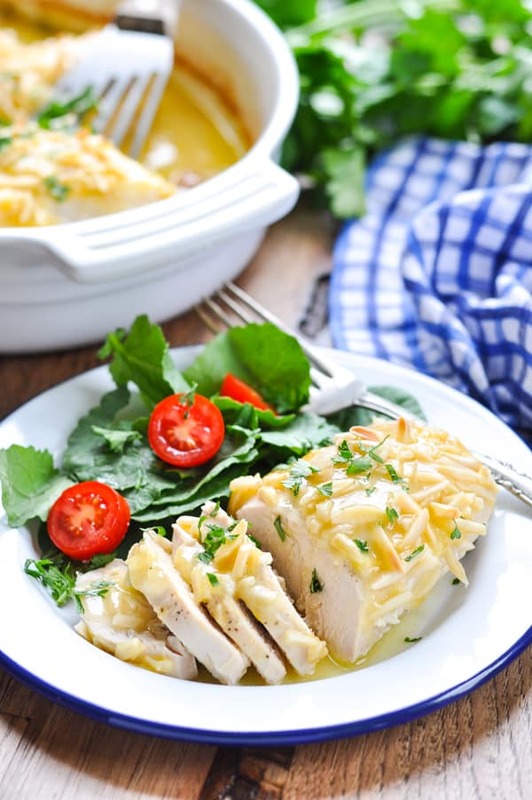 Place chicken in prepared dish and top each piece of chicken with a slice of Swiss cheese. In a separate bowl, whisk together condensed soup and wine (or broth). Spoon or pour over chicken. Bake, uncovered, for about 45 minutes - 1 hour, or until chicken is cooked through and reaches an internal temperature of 165 degrees F. During the final 15 minutes of baking, baste with pan sauce and top with slivered almonds. Return to the oven to finish cooking and to allow the almonds to turn a toasted golden brown. Cooking Just for Two? 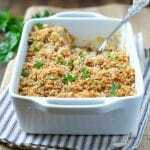 Cut the ingredients in half and bake the chicken in an 8-inch square dish. The rest of the cooking instructions remain the same. Instead of almonds, try topping your chicken with pecans, walnuts or chopped hazelnuts. For a quick-cooking dish, slice your large chicken breasts in half or purchase smaller 4-ounce chicken breasts. They will cook in about half of the time!